I’ve celebrated New Year in four countries: 30 times in the Philippines, twice in the USA, once in Japan, once in China (for Chinese New Year) and 10 times in Korea for the solar New Year and 13 times for Seollal (as what we call the Lunar New Year in Korea). I would say that I’m quite familiar with how this holiday is celebrated in the Philippines and in South Korea. What’s the difference with solar or lunar new year? Solar is always celebrated on January 1st in the Gregorian calendar, while lunar falls on the first day of the first month of the lunar calendar and it changes every year. In 2017, it falls on January 29th. In the Philippines, everyone celebrates New Year on January 1st but we also recognize Chinese New Year. No offense to Koreans but we came to know this event as such since Filipino-Chinese brought the celebration to the country. In Korea, the more important celebration is Seollal (Hangeul: ì„¤ë‚ ) as Romanized based on pronunciation. January 1st is also a public holiday but people don’t really think much of this day as much as they do on Seollal. In the Philippines, the two biggest holidays are a week apart from each other ~ Christmas and New Year. In most cases, people have big family reunions during this time and it is arranged at which family reunions people go. Like for example, my second eldest sister goes to her husband’s family reunion for the New Year. In South Korea, families gather at their “keun jib” (Hangeul: í°ì§‘) or the house of the clan (family) leader. Our í°ì§‘ is at my first brother-in-law’s house. My father-in-law is an only son and his father was the eldest in his family as well as his grandfather and great grandfather. My husband’s two brothers are married and we celebrate with them while his sister goes to her husband’s family. After seollal, it is the turn of the men to visit their in-laws. Our New Year celebration in the Philippines is more relaxed. We could serve whatever we want but it is a tradition to have at least seven kinds of round fruits (for financial prosperity), noodles like “Pancit” or spaghetti (for long life), ham, Edam cheese, fruit salad (mixed fruits in cream and condensed milk), ube halaya (purple yam dessert) and “lechon” or roast whole pig or chicken (depends on the family budget). This is what we call “Media noche” or the midnight feast eaten when the clock strikes 12! 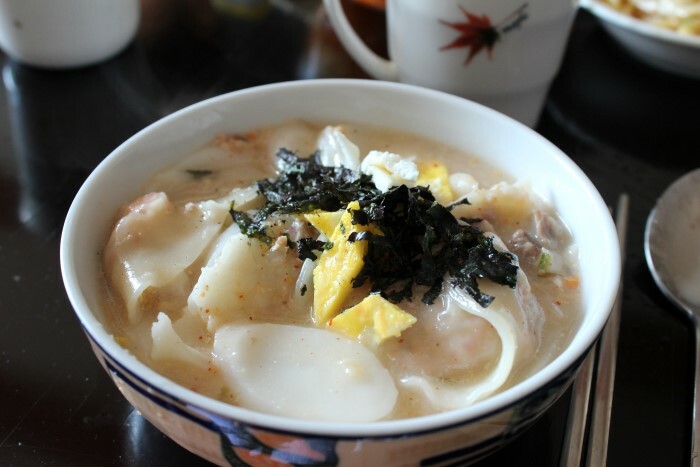 In South Korea, it is a must to serve ë–¡êµ­ (“tteok guk” or rice cake soup) or ë–¡ë§Œë‘êµ­ (pronounced as “tteok mandu guk” or rice cake and dumpling soup). The rice cake used in the is the thinly sliced cylindrical ones or ì¹´ë ˆë–¡ (pronouned as “kare tteok). The white rice cake, which is the same color as snow, symbolizes a bright new year ahead and having it is adding one year to one’s age. We eat this in the morning after the ancestral rite. In my husband’s family, we also serve food for the ancestral rite or ì°¨ë¡€ (pronounced as “cha-rye”). Christian families in Korea do not follow this tradition of serving their ancestors. Until I was ten years old, it was mandatory in our Filipino household to wear a new dress with polka dot design, new shoes and coins in our pockets. After that, we just wore red clothes as it is a lucky color according to the Chinese. I think that’s how I started to like the color red. We also wear festive hats. To welcome the New Year, each household spend money on fireworks. I don’t remember my family spending as much as other families in our neighborhood though. Sometimes we would just watch them blow aways thousands of pesos worth of dancing firecrackers, Roman candle, fountain, whistle bomb and Judas’s belt. Filipinos would know what those are. Some of them are quite dangerous and people lose limbs using the more powerful ones. That’s why many still prefer blowing trumpets or banging pots and pans to make noise and drive away bad luck or evil spirits. After the ancestral rite (and before we eat breakfast), we exchange bows in Korea following the family hierarchy. First, the children and their families bow to their parents. Then the younger siblings bow to the eldest sibling. Then the children bow to their parents. After all the bowing, we give money to the kids called ìƒˆë±ƒ ëˆ (pronounced “sae baet don”) inside a white envelope or sometimes in a ë³µì£¼ë¨¸ë‹ˆ (bok jumoni). The amount depends on the age and we also give more to whoever is entering first year in school (elementary, middle school, high school and university) to help them buy new things for school. Filipino and English are the official languages in the Philippines. We greet each other “Happy New Year” or “Manigong Bagong Taon” (Have a prosperous New Year!) on January 1st. 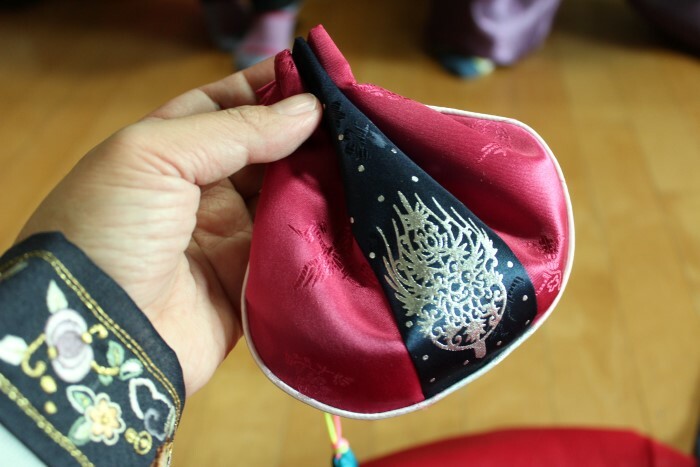 In South Korea, people exchange “ìƒˆ í•´ ë³µ ë§Žì´ ë°›ìœ¼ìƒˆìš”” (sae hae bok manhi badeuseyo) or “Please receive a lot of blessings this new year”. We also tell the elderly â€œê±´ê°•í•˜ì„¸ìš”â€ or â€œPlease be healthy.â€ and ê³µë¶€ì—´ì‹¬ížˆí•´ë¼ (kong-bu yeol-shim-hi-hae-ra) or “Study hard” to the kids. The mood in the New Year celebration in the Philippines is quite relaxed and informal. It is a festive event in every sense of the word. Preparation is costly and tiresome but there is excitement in the air as midnight approaches on New Year’s Eve. Meanwhile, the celebration in Korea is more ceremonial and traditional. Preparing the ancestral table follows specific rules as well as the ancestral rite. It is quite stressful for the eldest daughter-in-law who is the overall in-charged of the preparation. Filipinos celebrate Chinese New Year, too, by serving “tikoy” or Chinese New Year’s cake and wearing red clothes. In Manila’s Chinatown, lion and dragon dances attract local tourists. while Koreans also celebrate the solar New Year by buying a holiday cake and watching the ringing of the bell in Jonggak live on TV. Some go to the mountains or the eastern beaches to watch the sunrise. This is called “í•´ë§žì´” (pronounced hae-ma-ji) or watching of the first sunrise. Many cities in the eastern coast hold the í•´ë§žì´ì¶•ì œ or first sunrise watching festival. Thanks for a very detailed article about New Year celebration in Korea and Philippines. I really feel homesick right now. I think the New Year’s Traditions in Korea can only be felt if you’re part of a Korean family. If you’re here without any relatives, there’s no keunjib to visit. I use Seollal to travel. As I am a complete and total culture enthusiast, I greatly appreciate this post. It’s always really neat to read about how people in different places celebrate the same holidays. Question: why was it mandatory in your household to wear a new dress with polka dot design, new shoes, and coins in your pocket? And furthermore, if you were wearing a dress, did you even have pockets to put the coins in? Happy new year Miss Betchay!